So-called “fair chance” laws, which limit when and how an employer can use an applicant’s criminal history in making pre-hire and employment decisions, have been steadily increasing over the last twenty years. There are 32 states and over 150 cities and counties that have adopted in some form fair chance policies. Some of these fair change laws simply “ban the box,” prohibiting the disclosure of a criminal record on employment applications. Other such laws prohibit employers from inquiring about criminal history until later in the application process. The San Francisco Fair Chance Ordinance (FCO) does both. Since 2014, the FCO has defined San Francisco’s broad policy against early disclosure of criminal history information. The law prohibits asking about an unresolved arrest or conviction on a job application and strictly limits when an employer may inquire into an applicant’s or employee’s criminal history. In addition, the FCO contains a long list of criminal history information that an employer may not, at any time or by any means, inquire about or consider in making employment decisions. After an arrest or conviction history has been properly disclosed, the law requires the employer to go through several steps before the employer may deny employment or take other adverse action based on the applicant’s or employee’s record. Beginning October 1, fewer number of employees will be necessary to subject an employer to the FCO’s restrictions. Currently, the FCO applies to private employers that are located or doing business in San Francisco and that employ twenty or more persons (worldwide), as well as all city contractors and subcontractors. Effective October 1, the FCO will apply to all private employers with five or more employees (worldwide). Originally, the FCO prohibited covered employers from inquiring about, seeking records of, or considering criminal convictions or unresolved arrests until either a live interview or a conditional offer of employment was made to an applicant. Beginning October 1, all criminal history inquiries will be prohibited until after a conditional offer has been made. The amended FCO retains these categories and, as of October 1, a new category is added – a conviction that arises out of conduct that has been decriminalized since the date of conviction. This includes, for example, the non-commercial use and cultivation of cannabis. The administrative penalties for FCO violations will increase as of October 1. For a first violation, penalties range from $500 for each applicant as to whom the violation occurred, and for multiple violations they increase up to $2,000 per applicant violation. The FCO amendment also creates a private right of action that arises 90 days after a complaint has been filed with the Office of Labor Standards Enforcement and 30 days have passed without the City Attorney’s Office noticing its own action. San Francisco has released a new FCO Notice which reflects the amendments to the FCO. Covered private employers and city contractors are required to post this notice effective October 1, 2018. The notice must be posted in a conspicuous location at every workplace, job site, or other area in San Francisco under the employer’s control that is frequently visited by their employees or applicants. The notice must be posted in English, Spanish, Chinese, Tagalog and any language spoken by at least 5% of the employees at the workplace. 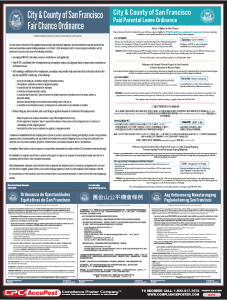 CPC’s official San Francisco Fair Chance Ordinance Poster has been updated for the October 1, 2018 amendment effective date.